Static electricity is, simply put, electricity that is stuck in a system with nowhere to go. Within a typical electrical circuit, the charge is contained within a closed loop and returns to the source after carrying out a specific task, powering your kettle or lighting your office for example. Static is different in that it can accumulate, often unnoticed, on plant, containers or even personnel. Due to lack of awareness or complacency in the workplace this build-up of energy can result in devastating, yet entirely avoidable accidents. The accumulation of electrostatic charge is caused by barriers between the static charge and its path to ‘true earth’. For example, electrostatic charge on steel drums can be prevented from being dissipated by the presence of protective coatings, rust, debris build up and even surface layers of the stored product. Static build up on personnel can be a result of wearing the wrong footwear, or the use of insulating gloves when handling product. Electrostatic sparking is caused by the rapid ionisation of the atmosphere between two objects at different electrical potential. When this voltage reaches a critical level, ionisation occurs in the form of a spark. If the atmosphere across the spark is between its upper and lower flammable limits, ignition of the atmosphere will occur, resulting in fire or explosion. 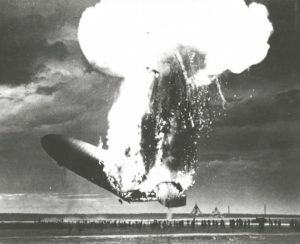 Possibly the most famous example of a disastrous electrostatic discharge is the Hindenburg ‘Airship’ explosion. According to a team of experts recently assigned to conclude what caused the vessel to explode on 6th May, 1937, determined the most likely cause was a build-up of electrostatic energy transferred to the airship by passing through highly charged thunderstorm clouds. The problem came about during landing, as the ground crew reached for the tie down ropes, a path was created for the charge to spark to ground as contact with the earth was made. This, in turn, ignited the Hydrogen gas used to fill the ship, resulting in the explosion that killed 36 passengers that day. “…serious deficiencies in the institution’s approach to laboratory safety contributed to a lapse in proper risk assessment and lack of a culture of safety that ultimately led to the accident”. 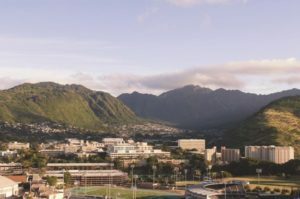 A research fellow, visiting the Hawaii Natural Energy Institute biofuels research laboratory, was transferring a mix of flammable gases into a low pressure tank when the explosion occurred. The explosion seriously injured the lab technician, causing her to lose her arm. The University suffered an estimated $1,000,000 in damage to property and faces up to $115,500 in fines. Initial investigations put the blame on an incorrectly specified pressure gauge that was not suitable for use with flammable gases, however further studies into the event placed the blame on static discharge within the tank. It appears the explosion could have been avoided however by carrying out a more detailed risk assessment of the process. In fact, although the experiment had been carried out 10 or 11 times previously it was noted that the investigators discovered a number of ‘near misses’ that should have caused the process to be shut down and investigated further. For example, a ‘cracking’ sound was reported during a similar experiment on another tank but the technician was advised to simply not use that equipment again. Equally of concern is that the technician had also reported receiving static shocks when touching the pressure vessel but was told not to worry about it. Where it is likely to occur in the workplace? It is always essential to consider static accumulation within workplace processes, but more so when these processes involve the creation of potentially explosive atmospheres. Such activities do not have to involve large quantities of flammables liquids or dusts. A few litres of flammable liquid, under the right circumstances can create the perfect conditions for an explosion throughout a workshop or laboratory. 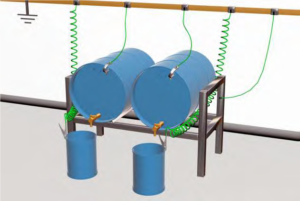 Common activities often include the collection of waste into larger drums/IBC’s for bulk disposal, or decanting of good product from larger drums into smaller containers for transfer into the workshop or laboratory. During both processes a release of flammable vapour is often unavoidable. A static discharge at this time can easily result in a devastating explosion or fire. Responsibility for these activities most likely rests with the operators, however due to the absence of a visible or tangible hazard, a lack of understanding or awareness can lead to complacency or honest mistakes and an electrostatic ignition. As an example, a calculation can be made to show the energy of an electrostatic charge typically found on a metal drum containing liquid. It is clear to see that there is easily enough energy in commonly found activities to ignite a flammable atmosphere (within the explosive limits) of regularly used chemicals. There are many articles and best practice guides available in the market. In the UK, the DSEAR – Dangerous Substances and Explosive Atmospheres Regulations requires that a thorough risk assessment is carried out by a competent person. Regulation 5 – Risk Assessment. How we can solve the problem. Firstly, Chemstore can supply an on site assessment of your processes and facilities. If necessary, we can carry out a full DSEAR Risk Assessment for you to address any concerns you have regarding your process and to help put a plan in place for safe practices going forward. This can then be re-enforced with operator and staff training and awareness courses to improve knowledge of the risks and associated hazards. Chemstore’s Firevault and Safety Cabinet ranges can be supplied to ensure that all flammable liquids and gases are properly stored and that the environment for material transfer is made safe. We can also offer a range of grounding equipment, depending on the application, to ensure operators have the right equipment to carry out the tasks on site. Preferably, such equipment should not only monitor the presence of a connection to true earth (thus ensuring and static can safely drain away) but should also alert the operator if this state changes and the system becomes potentially dangerous. The operator can then shut down the process until the issue can be rectified. 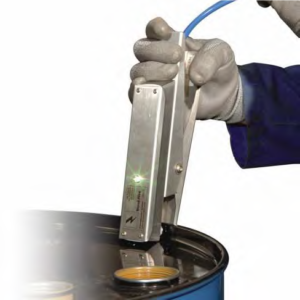 For example, when transferring liquids to/from 200L metal drums – we would typically recommend using ‘pressure clamps’ capable of penetrating any surface barriers like rust, protective coatings usually present in such scenarios. These clamps must be capable of achieving the (industrially accepted) contact resistance of 10 Ohms or less. Not only should they achieve this level of conductivity, but they should also be able to notify the operator that a good connection is ‘made’, or more importantly ‘not made’. Although ‘active’ systems clearly offer a preferred level of risk mitigation, sites may (after careful risk assessment) elect to implement a more passive system that does not have ground status monitoring or feedback capability. In this case it is essential to understand the limitations of such a system, to ensure that a good connection has indeed been made and continues to be made during the process. The use of certified and approved Factory Mutual or ATEX equipment is essential to achieve this – which Chemstore can supply on request.